We have just fitted our new air disinfection system in our implant treatment room, the “Inov8″. This system clears the air of all harmful bacteria, viruses and fungi. This ensures you are protected from harmful bugs floating in the air and further develops our practice focus on all aspects of providing the highest levels of sterility and hygiene for our patients. The system operates by using hydroxyl radicals that mimic the natural disinfection qualities of outdoor air and protect you in an enclosed environment. It operates 24 hours a day and is currently used by many major hospitals around the country to combat superbug outbreaks. Inov8 unit was a winner in the NHS Smart Solutions for HCAI Programme 2009. Ref: Matt Reid from the New Cross Hospital’s Infection Prevention Team. This new system complements the Sterilox water disinfection system, which we have used for many years. Invented by Liverpool University for many years. 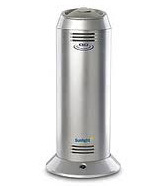 This generates ‘superoxidated water which kills all harmful viruses and bacteria, ensuring that all water sprays in our dental units are safe.